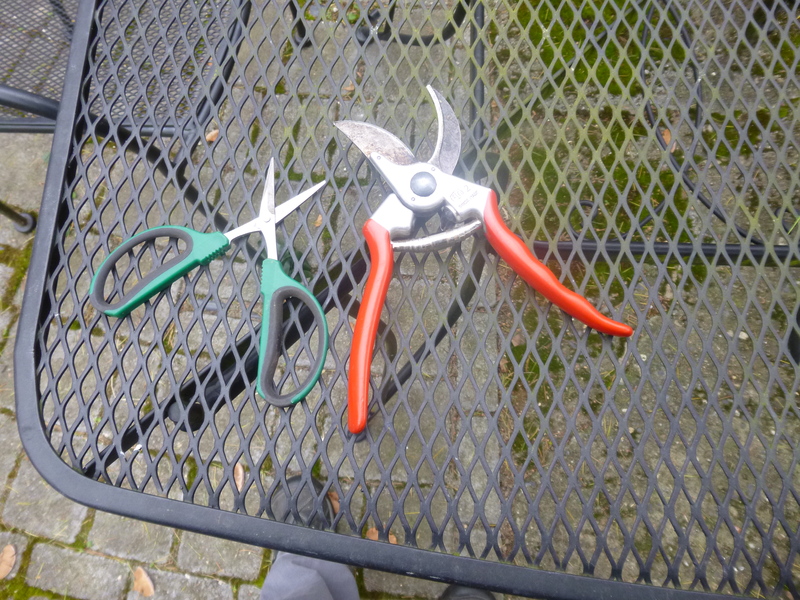 Get Out the Clippers! 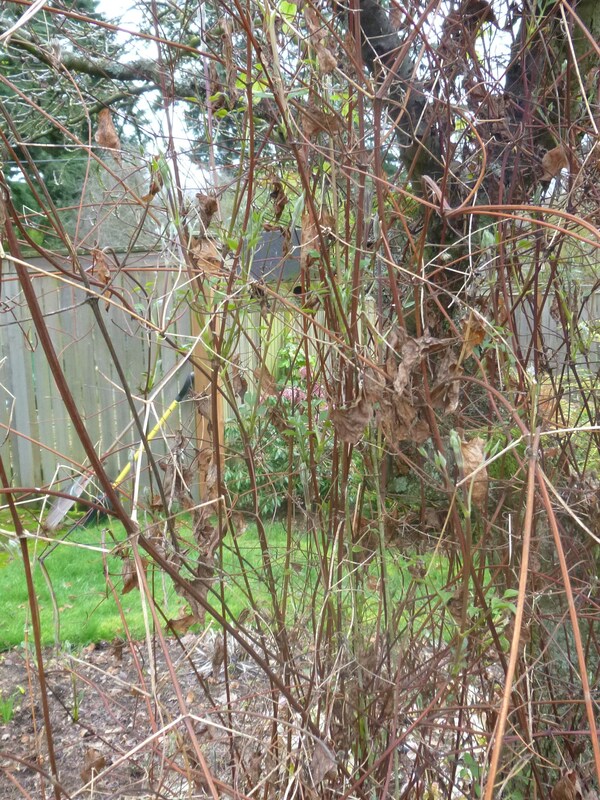 It’s Clematis Pruning Time in Seattle. Yikes! 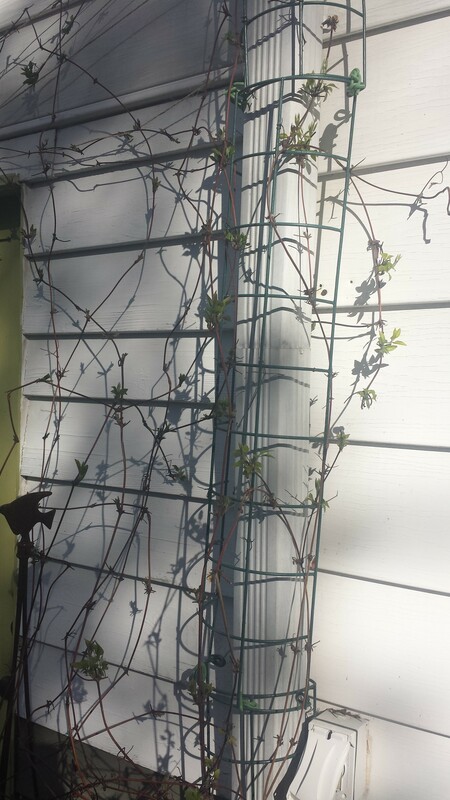 C. Will Baron is a MESS and growing fast. 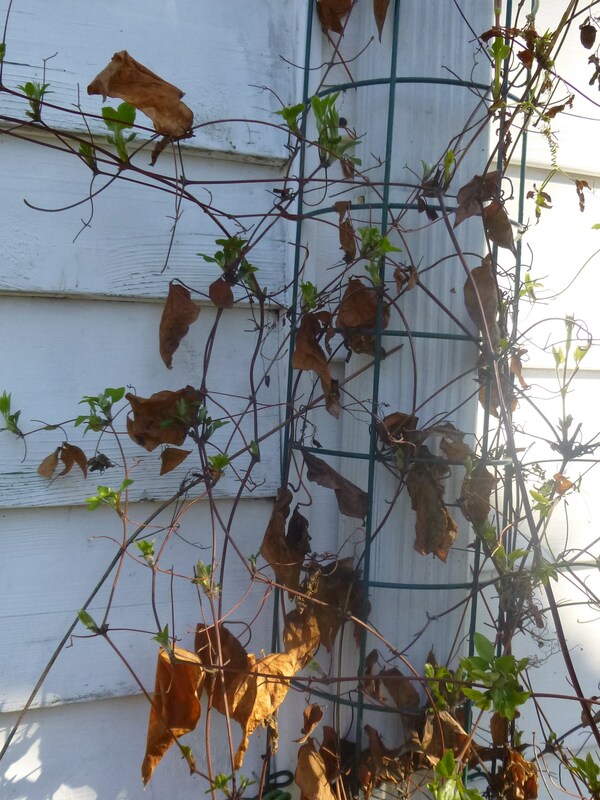 Even though I pruned most of my summer-blooming clematis last fall, I have many spring bloomers in dire need of pruning now. 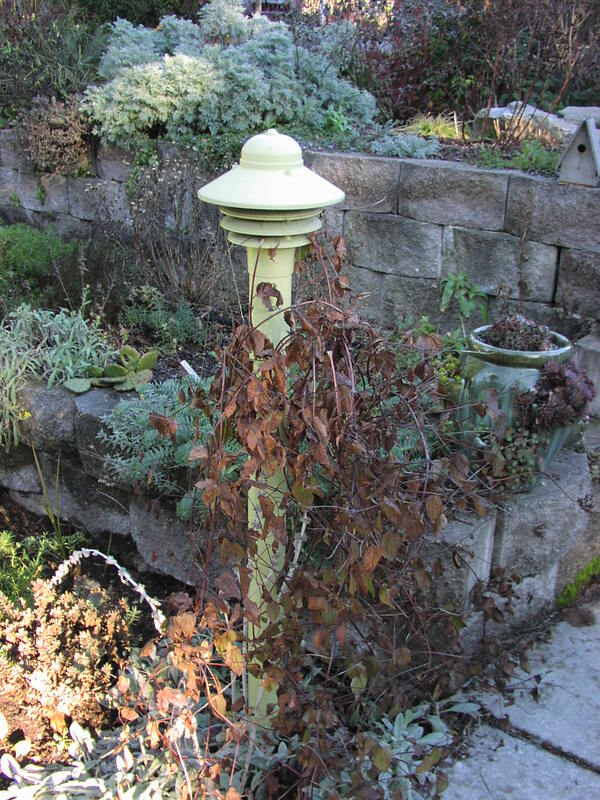 Lately, here in Seattle we’ve had RAIN RAIN RAIN and the ground is soggy and sloppy! 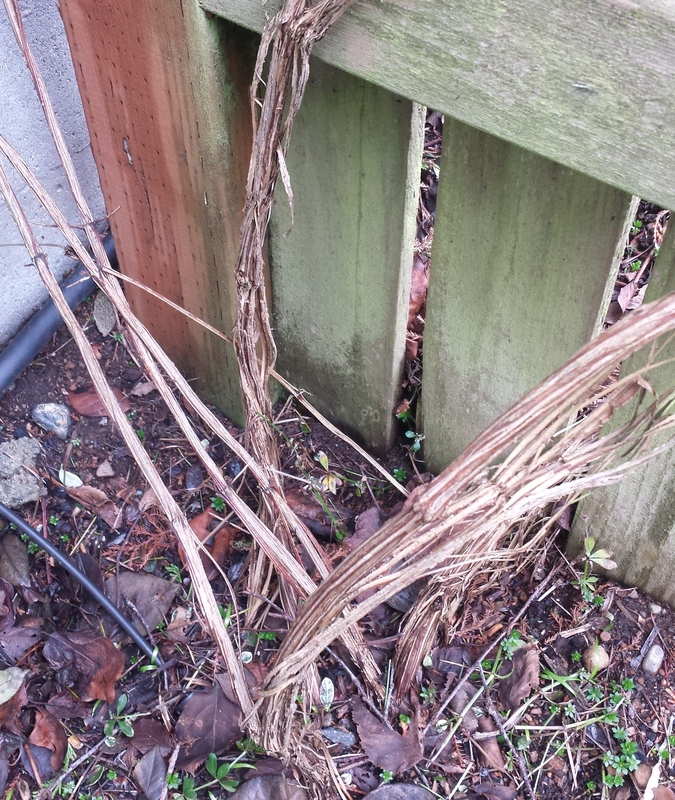 I know, I know, Seattle is supposed to be rainy but we got spoiled with a long dry spell earlier in the winter. 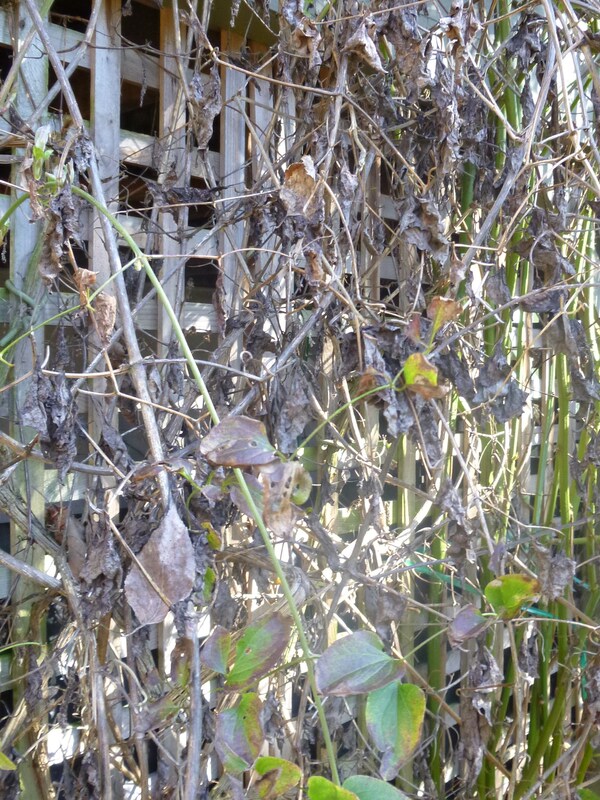 Clematis Will Baron, above, has become a serious rat’s nest that certainly needs my help. 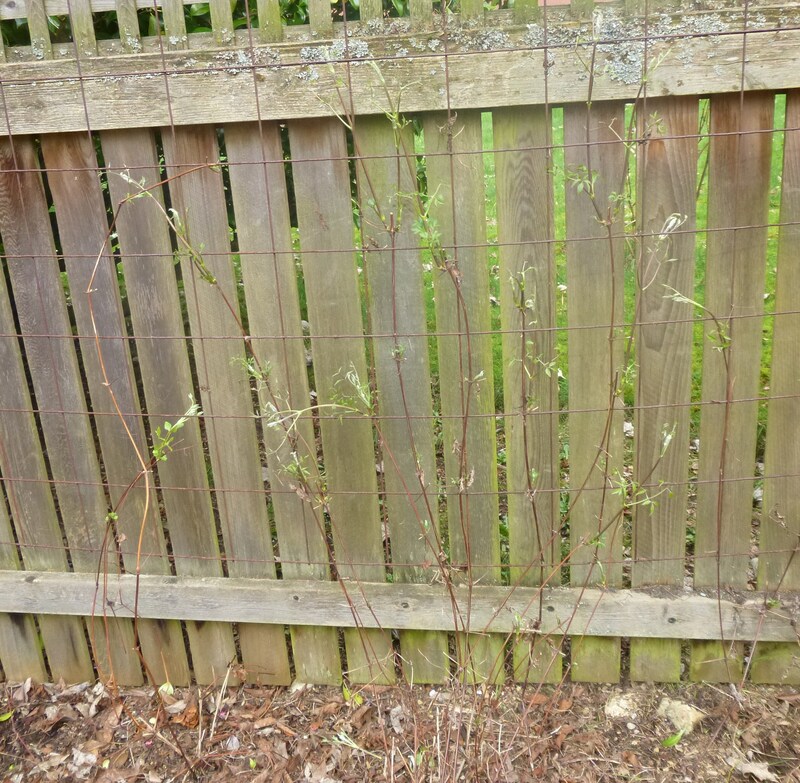 This one has been in the ground for going on 10 years and has overwhelmed its partner, the rose ‘Buff Beauty’, which I have not been able to prune much in two years. 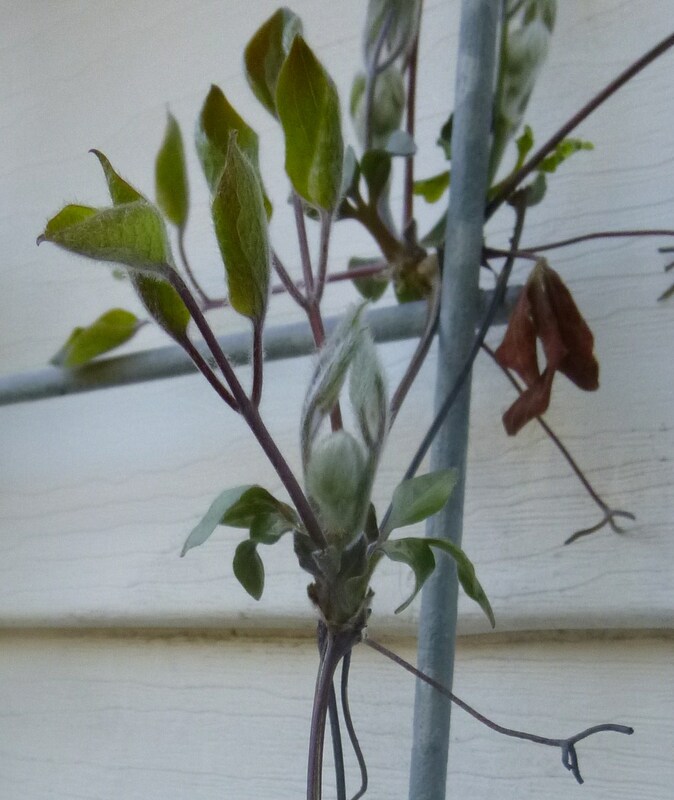 This clematis is ready for a radical renovation! 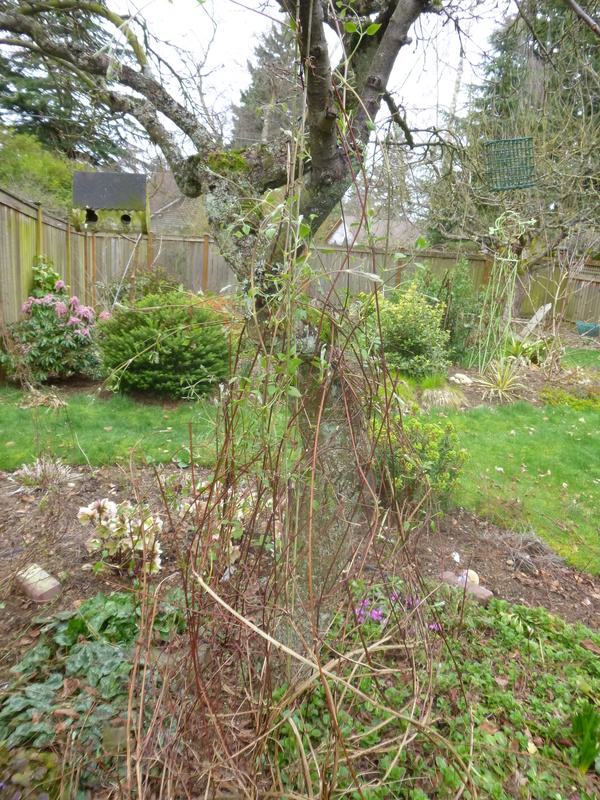 My plan of attack is to cut out the three really old canes at ground level (see photo below), then slowly work my way up to prune and gently pull the rest of these old canes out bit by bit. 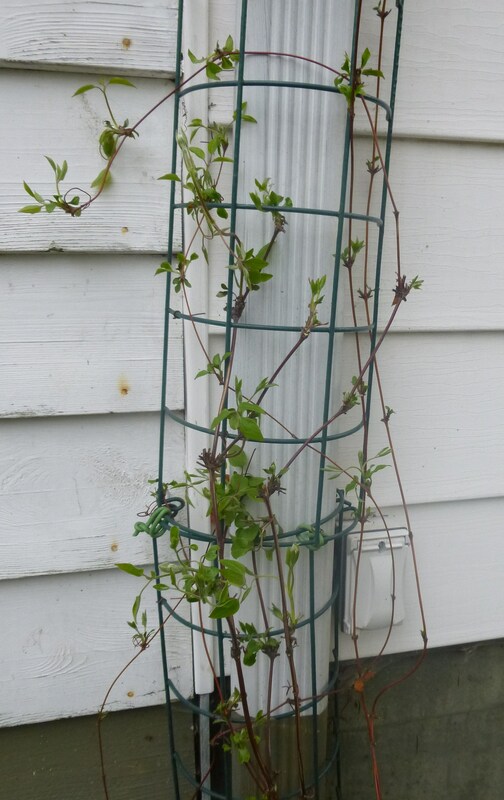 This should clear up the mess and allow the three newer canes to take over and grow more politely with the rose, which I will finally get to prune. 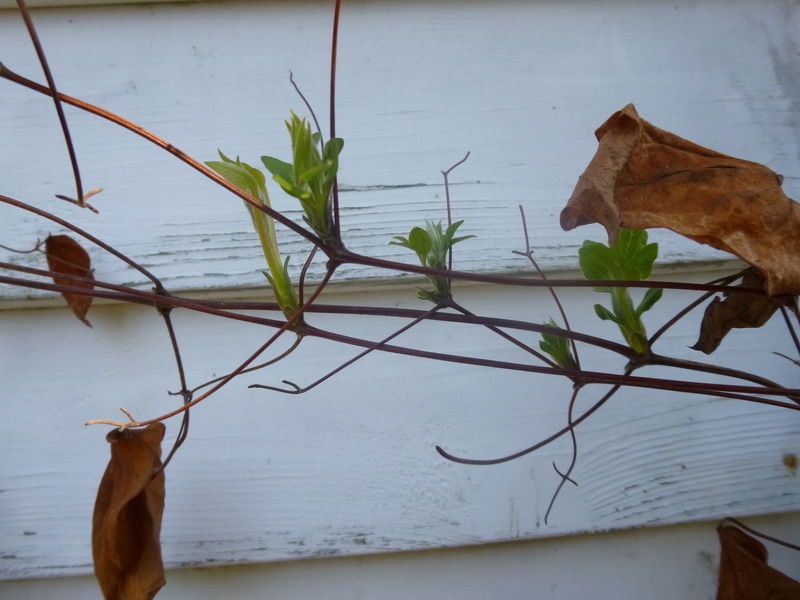 I’ll remove to two old peeling canes and keep the three younger ones. 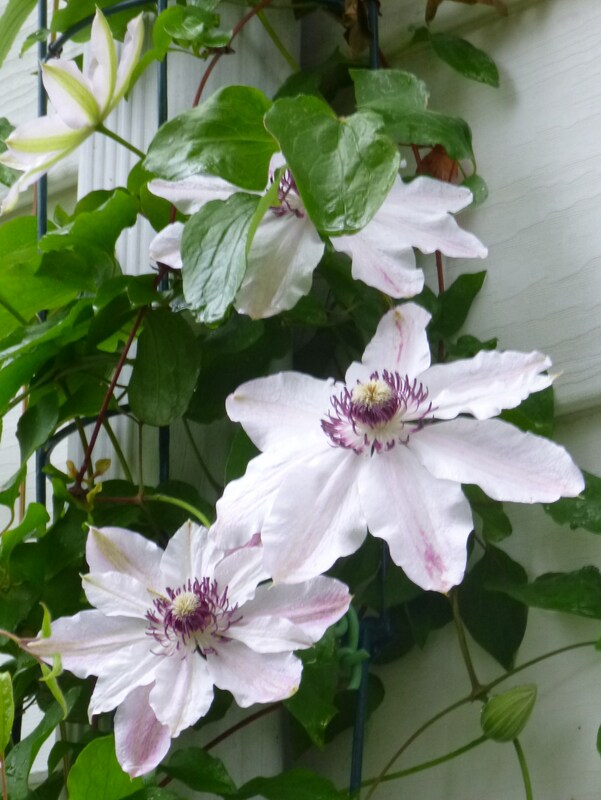 All the while, I can think of the lovely lavender-blue clematis that will bloom with the peachy roses of Buff Beauty in June. 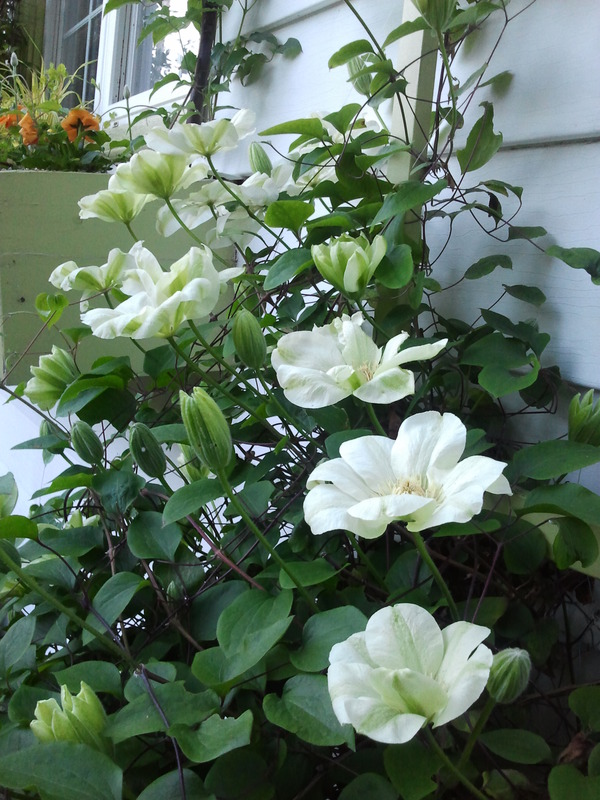 Between raindrops a few days ago, I managed to prune Clematis Fair Rosamund. 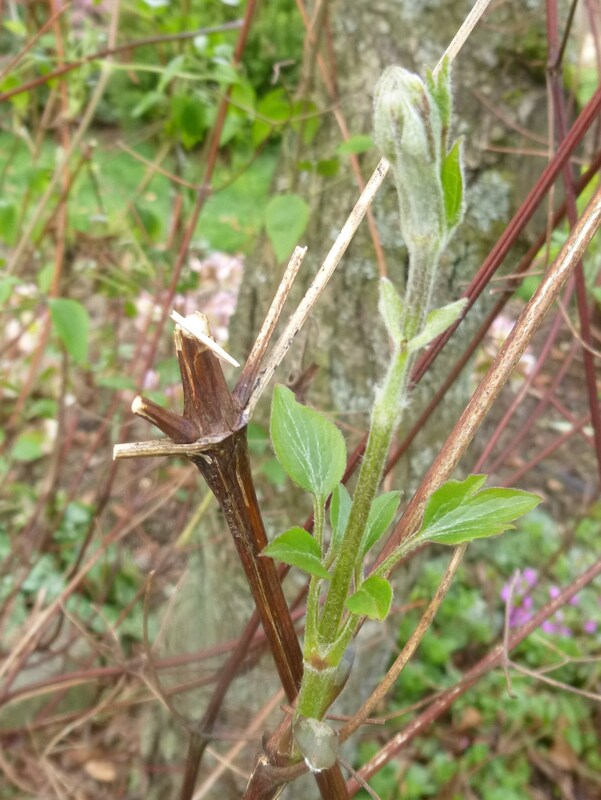 The clematis of Pruning Group B (or 2) require fiddly pruning, a little like detailing a car – very time-consuming. The finished product you see below took me about three hours. 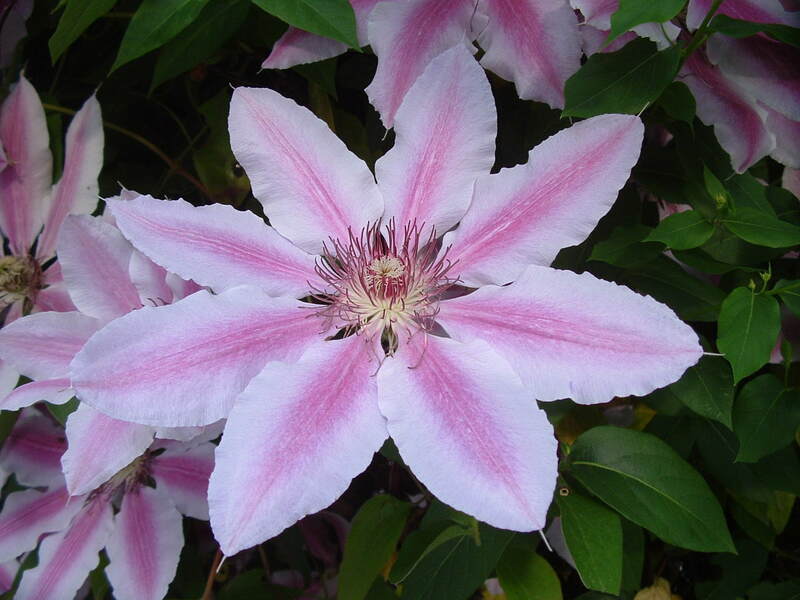 But in a very few months when I see the beautiful white blossoms tinged in pink with dark red anthers, I’ll be glad I took the time. 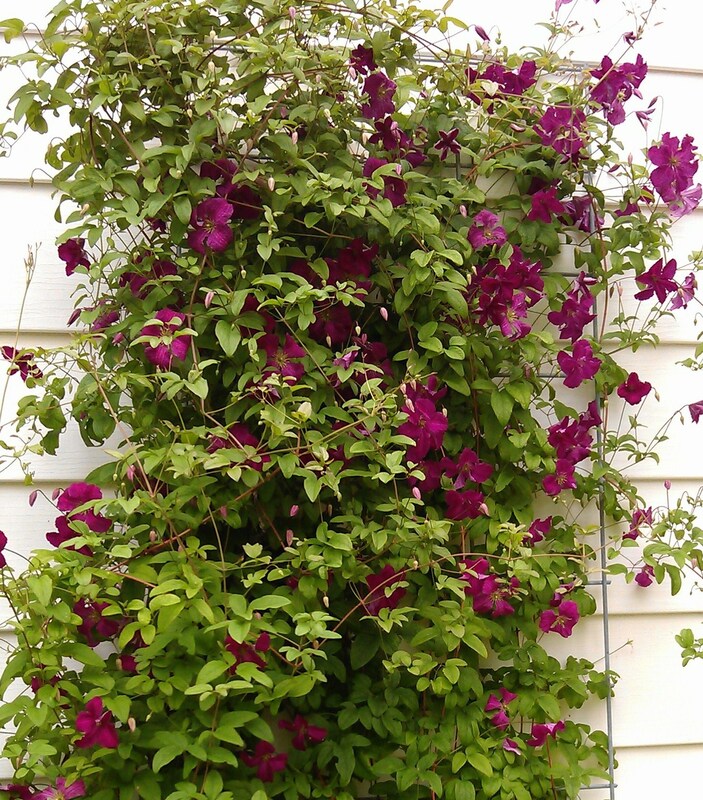 And it’s fragrant, to boot! 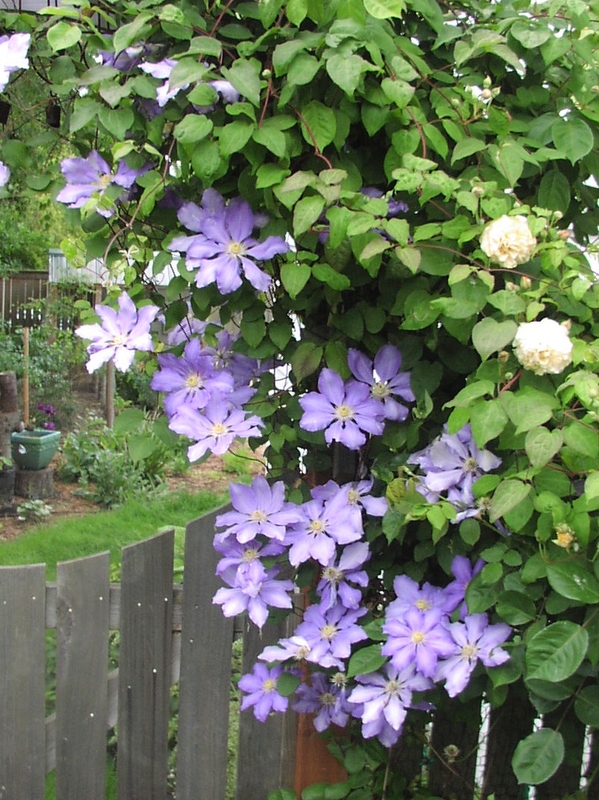 If you live in Greater Seattle and would like to learn more about pruning and caring for clematis, I’ll be speaking at Sky Nursery, just north of Seattle, on Saturday March 8, 12:30pm. 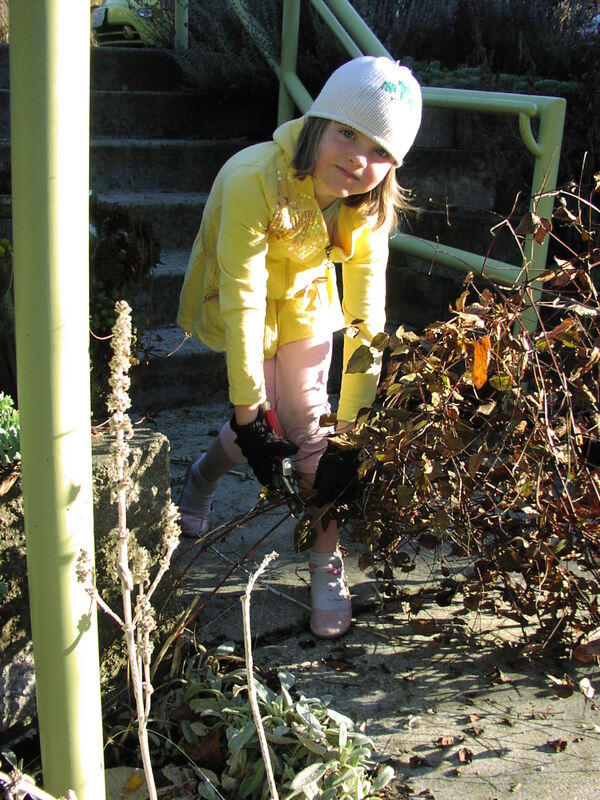 This is part of PlantAmnesty’s Fifth Annual Prune-a-thon at Sky Nursery. 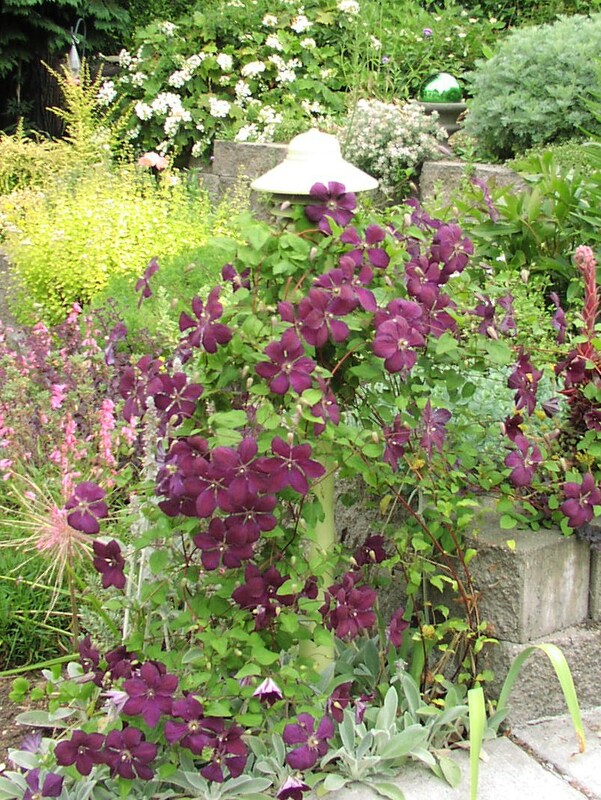 There will be eight free pruning talks (clematis, roses, rhododendrons, hydrangeas, Japanese maples, and more) plus free 15-minute mini garden designs from professional designers for all comers! Come on down! 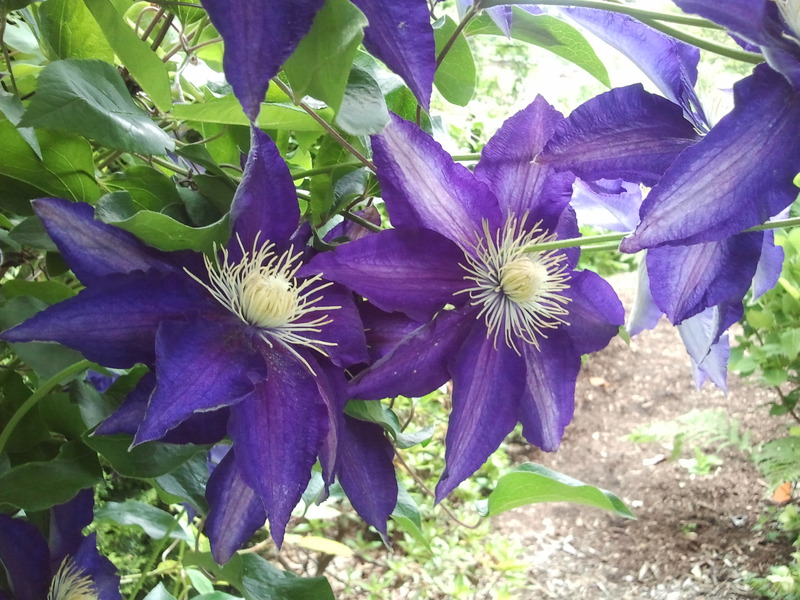 Lately, we here in Seattle have been blessed with a few sunny days and, oh , the juices are flowing — in me and in my plants! 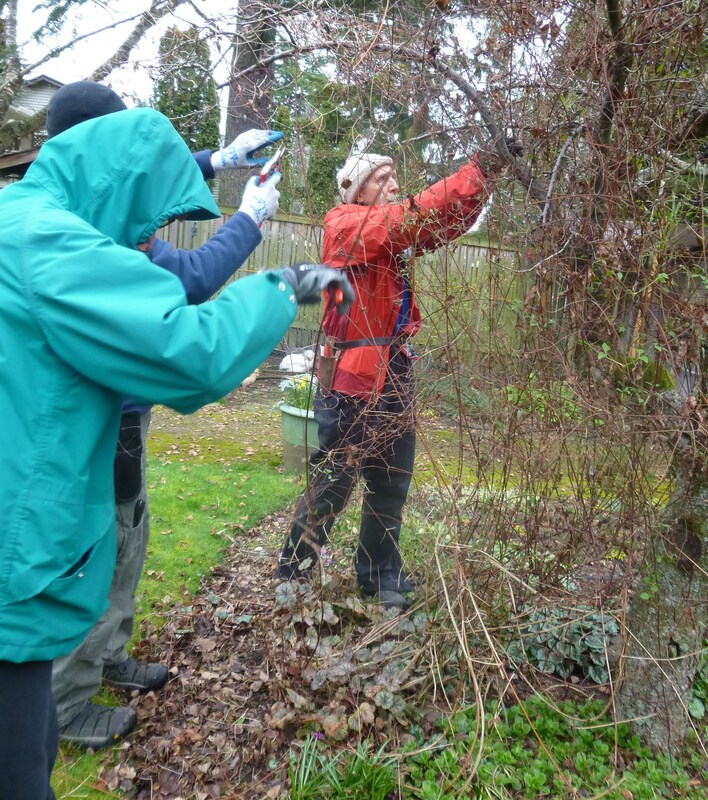 Garden cleanup, including weeding, sweeping, chicken-coop cleaning, and many assundry early spring tasks have been filling my outdoors time (when I’m off from work on sunny days). 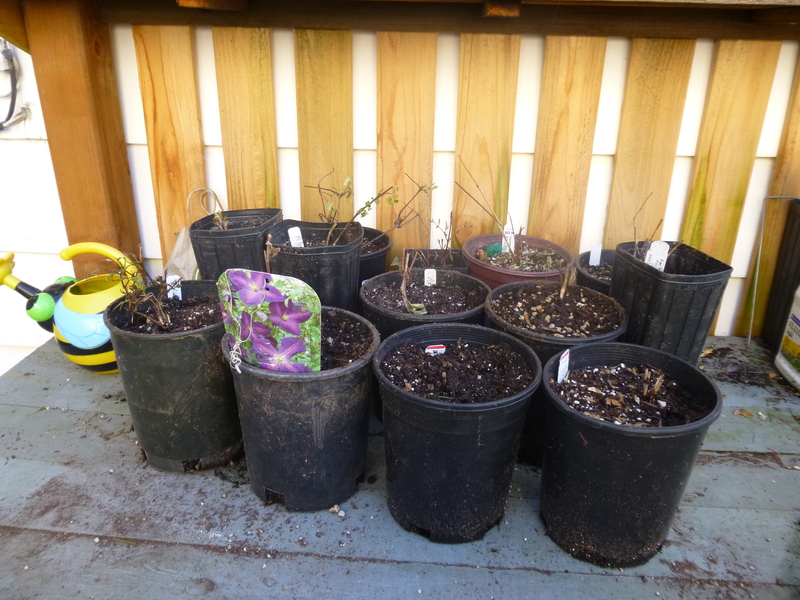 One task I accomplished is to gather together all the clematis that have showed up my potting area over the past several months. 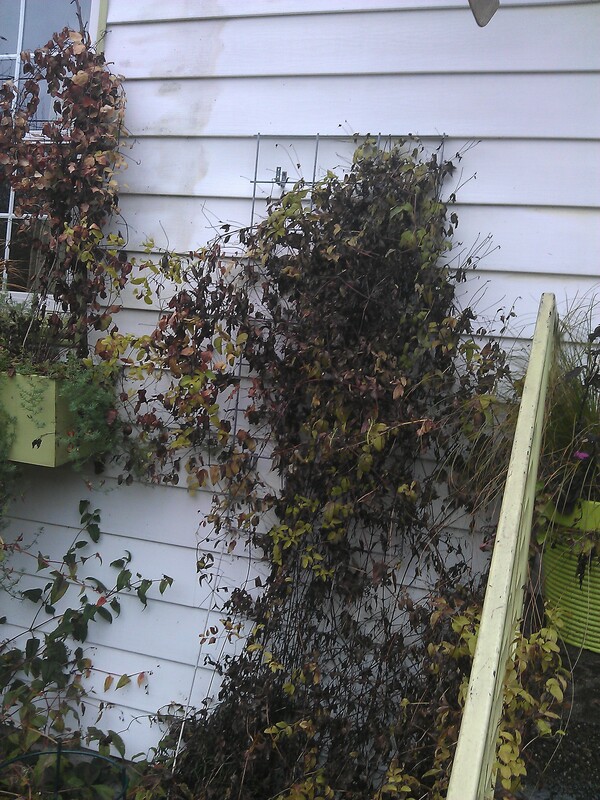 Ahhhhh, such glorious promise in all those pots. 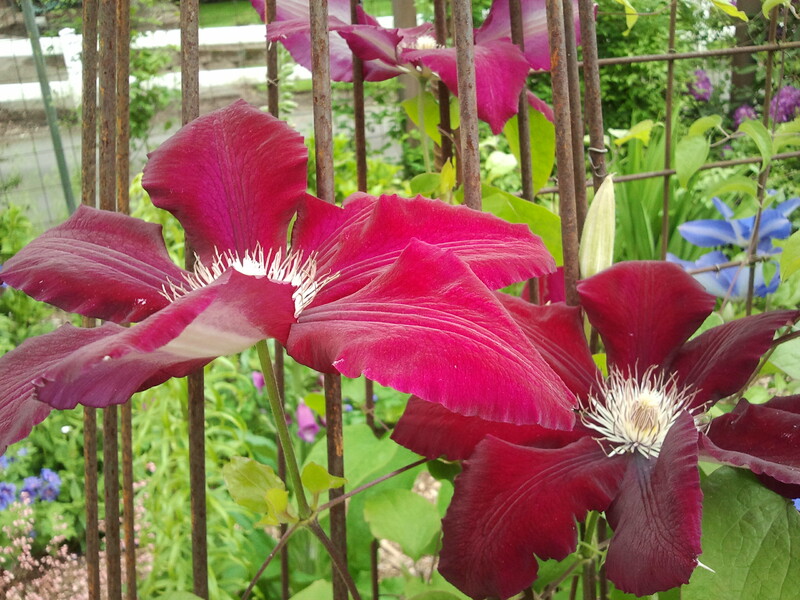 Now that rain is forecasted for a couple of days, I can stay cozy inside, check all my clematis resources, and plan where each new baby will go. 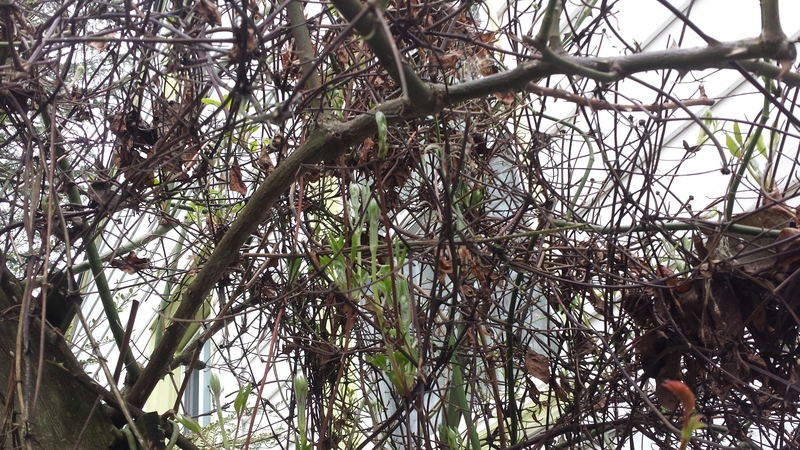 Most of my clems in the ground are sprouting now and need pruning badly, but I’ve been holding off. 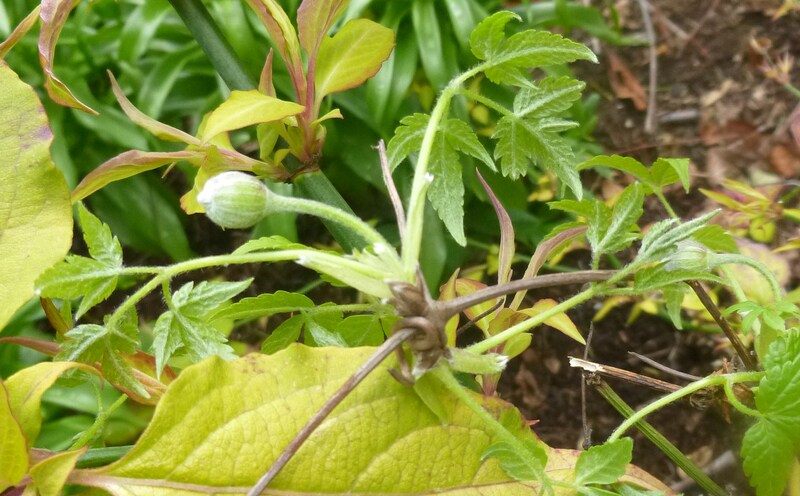 On Thursday, I have the privilege through my job at PlantAmnesty to teach a small cadre of students (4 or 5) how to prune clematis in my garden. 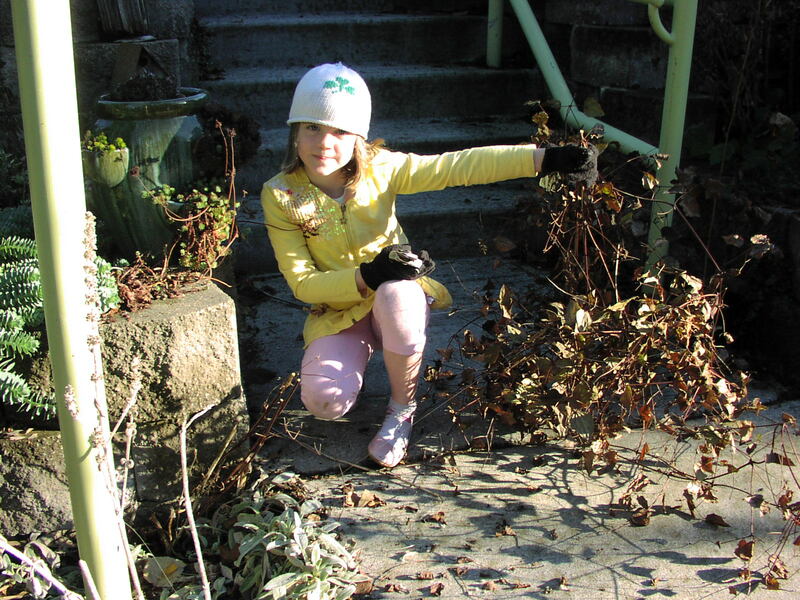 I will discuss pruning and demonstrate on my own plants and then allow the students hands-on practice. 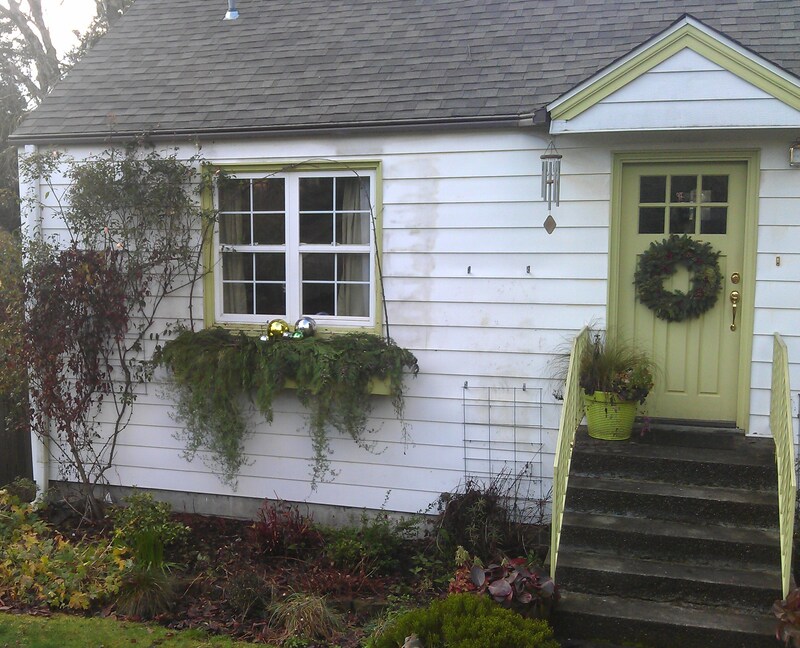 I’m really looking forward to the workshop and will be sure to post before and after photos!